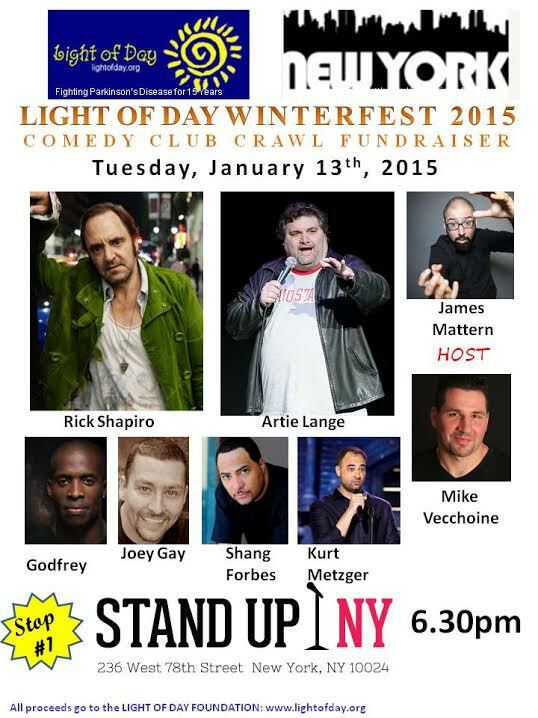 PARKINSON’S DISEASE COMEDY CRAWL FUNDRAISER Sponsored by the LIGHT OF DAY organization. Rick Shapiro and STAND-UP NY are honoured to be part of the First Annual NYC Comedy Crawl Fundraiser for PARKINSON'S DISEASE. Our comedy community has been effected by this disease. Our goal is to raise awareness, show support and have friends of his from the community help with this cause – and make people laugh. The stage has saved Rick. Won’t you join us? All proceeds will be donated to the www.LIGHTOFDAY.org raise awareness, educate and help find a cure. Actor, comedian, author and poet, Rick Shapiro covers the entertainment spectrum. Rick Shapiro is one of the most innovative and surreal comedic artists to date: A staple of the NYC and LA Underground Comedy Scene. Shapiro, a 30-year comedy stage veteran and master of long-form and Improv can also be found on multiple television channels: HBO, FX, CBS, IFC and Showtime. His cameo in Chris Rock’s TOP FIVE releases on December 12th. Additionally you can see Shapiro on MARON, LUCKY LOUIE, LOUIE, POOTIE TANG, PROJECT X, 2 BROKE GIRLS, and THE LEAGUE. Shapiro was diagnosed with Parkinson’s Disease in April of 2013. Although today Shapiro is bi-coastal, he can be found boxing and beating this disease whilst working on multiple projects, including comedy, acting, writing and painting.